Keeping in line with the mission of the Catholic Church and Newman Catholic Campus Ministries, we provide college students an opportunity to share their faith with high school students preparing to receive the Sacrament of Confirmation. Students willing to serve as part of these retreat teams will help lead the retreats through their witness, leading of small groups, sharing their testimony, and participating in dramas. Training is provided. Mark the dates in your calendar now! If you are interested or would like more information, contact Father Mike! Ask Fr. Mike about Upcoming Confirmation Retreats! We will be taking Mission Trips this school year. Stay tuned! Extraordinary Eucharistic Ministers help to distribute the Body and Blood of Christ at Mass. Training is held at the start of each semester. Those serving in this ministry are called to proclaim the Word of God and the Prayers of the Faithful at Sunday Masses. The mission of those called to this ministry is to help members of the parish enter into the power of the Word of God. Ushers warmly welcome worshipers at the Sunday Masses. They pass out worship aids and bulletins before Mass, collect the offering, and assist worshipers as needed. 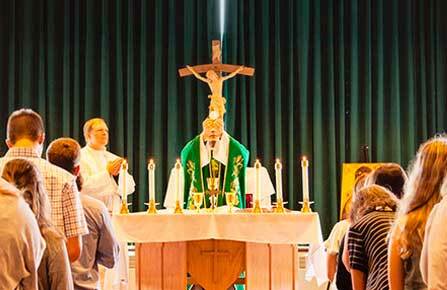 Support priests and other ministers by setting up all items required for Mass. They are responsible for returning all items to proper storage facilities following Mass. The Sacristan’s ministry is to help the priest and community enter into prayer before and during Mass. Servers assist at the altar at the Masses in accordance with the norms of the Church. In a very particular way they place themselves at the service of the priest during the liturgy. Music greatly enhances the worship services and faith of our students. If you would like to share your musical gifts as a singer or instrumentalist with the Newman community please join us in this ministry. If you would like to get involved in any of these ministries, whether it’s one or all of them, please click here to contact Nicole Hire or click here to contact Neal Smith. Thank you for being willing to serve the community!